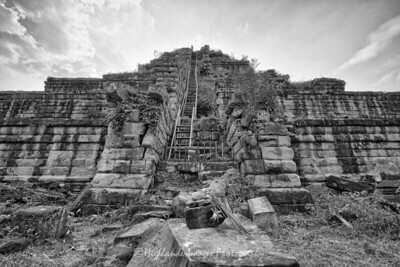 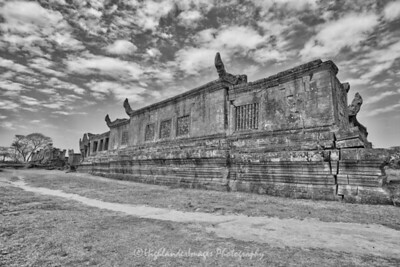 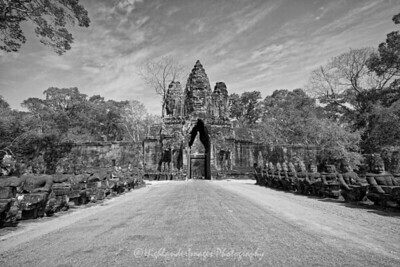 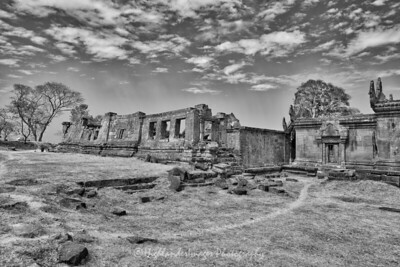 This is a unique collection of B&W images of temples in Cambodia. 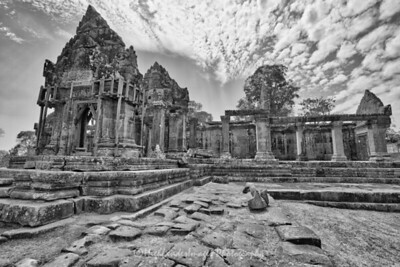 From the 9th century to the 15th century the Khmer Kingdom was at its height and dominated large parts of South East Asia. 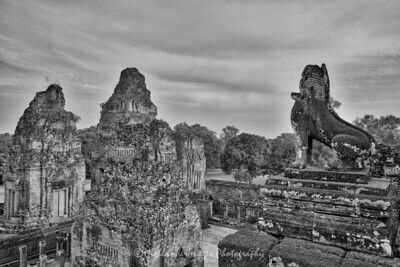 At its heart the capital city of Angkor was, in its time, the most extensive urban complex of the world and had as many as three quarters of a million people living there. 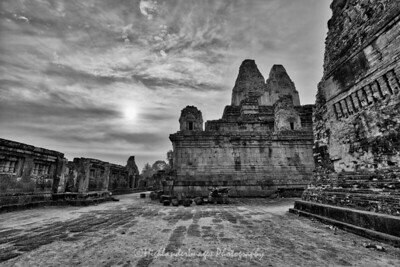 In today's perspective the city covered around 400 square miles, an area equivalent to the five boroughs of New York City. 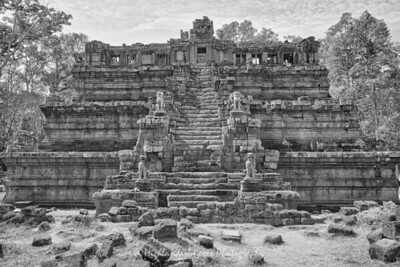 The city of Angkor rose to success through the ingenious manipulation of the seasonal rains resulting from the construction of a complex water system comprising reservoirs, dams and irrigation channels. 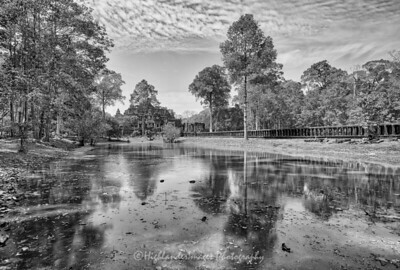 Though plenty of water was available during the rainy season, the large reservoirs or barays that were constructed allowed control over precious water resources during the dry season and during periods of drought. 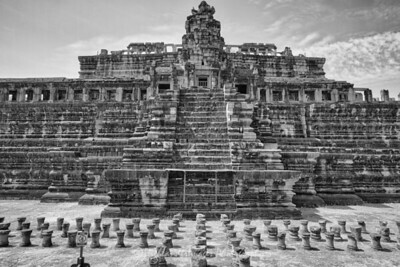 This technology provided a continuous and predictable supply of water and plentiful food which resulted in the successful growth and development of the city. 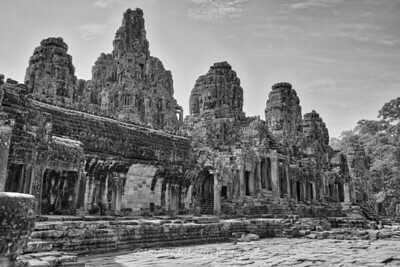 This vast complex of waterways however required a high level of maintenance and this, combined with possible unusual weather conditions, may have caused the ultimate demise of this once great civilization. 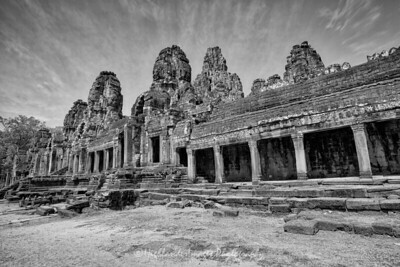 Like other high technology civilizations such as the Incas, Aztecs and Egyptians the City of Angkor declined in a dramatic disappearing act. 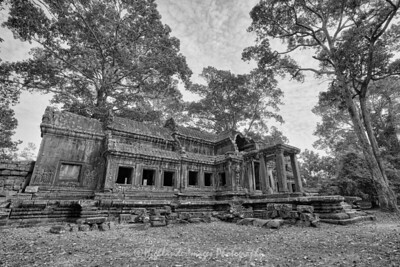 Henry Mouhot, a French naturalist and explorer, and who made numerous expeditions to Siam, Cambodia and Laos, was instrumental in the "re-discovery" of the Angkor temples in 1858. 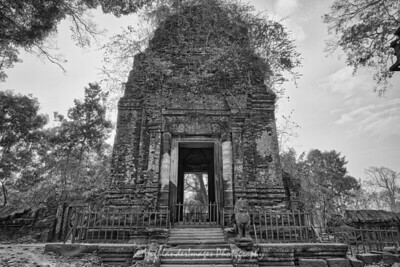 Other western explorers had however visited this area years before Mouhot and there are records of Portugese monks and traders visiting in the late 16th century. 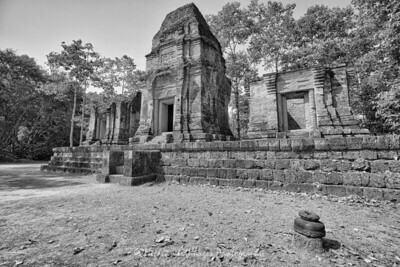 The great city and temples remained largely cloaked by dense jungle until the late 19th century when French archaeologists began a long restoration process. 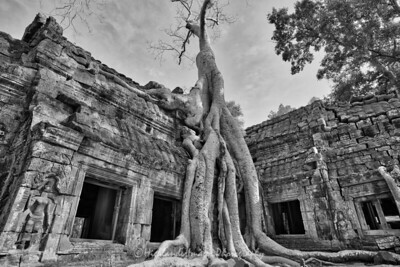 From 1907 to 1970 work was under the direction of the École française d'Extrême-Orient, which cleared away the forest, repaired foundations, and installed drains to protect the buildings from water damage. 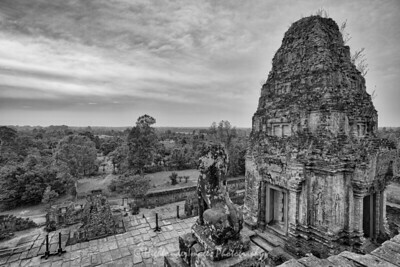 Work resumed after the end of the Cambodia civil war, and since 1993 has been jointly co-ordinated by the French and Japanese and UNESCO through the International Co-ordinating Committee on the Safeguarding and Development of the Historic Site of Angkor (ICC), while Cambodian work is carried out by the Authority for the Protection and Management of Angkor and the Region of Siem Reap (APSARA). 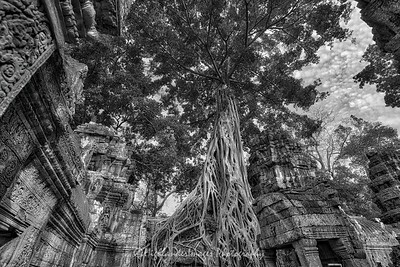 In the Angkor region we are left today with a wonderful, rich legacy of temple complexes, some restored but many still hidden and overgrown by trees and creepers. 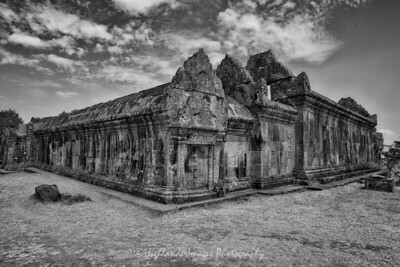 These mystical tumbledown temples of Angkor can only hint at the level of sophistication and complexity of the Khmer Kingdom and the wondrous Lost City of Angkor. 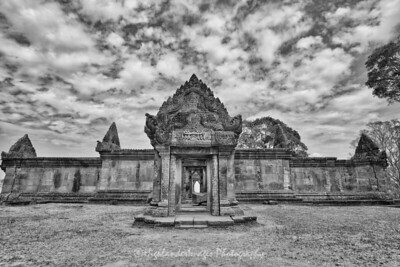 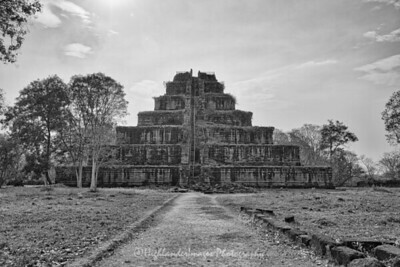 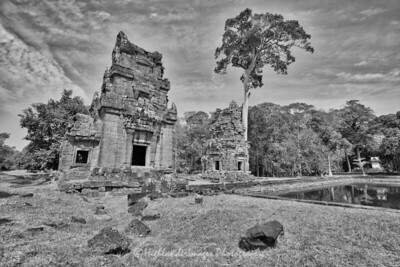 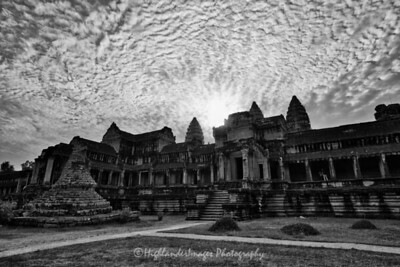 These high quality, black & white prints of selected Cambodian temples printed in either MetalPrint high gloss or MetalPrint satin finish and in a variety of sizes. 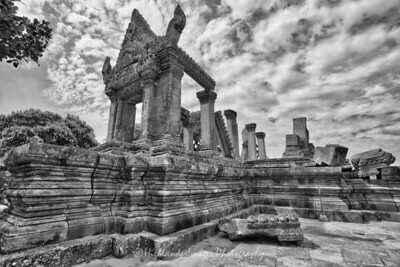 This set of high quality prints have been priced as a special package as a set of 4 and would make an exceptional framed series for the collector.